It was with a surprising amount of sadness that I closed the front door of our apartment in Hong Kong for the very last time, pulling it in with a very final ‘click’, knowing that I would never be going back in. But, that’s life I suppose. In order for one adventure to begin, another must end. 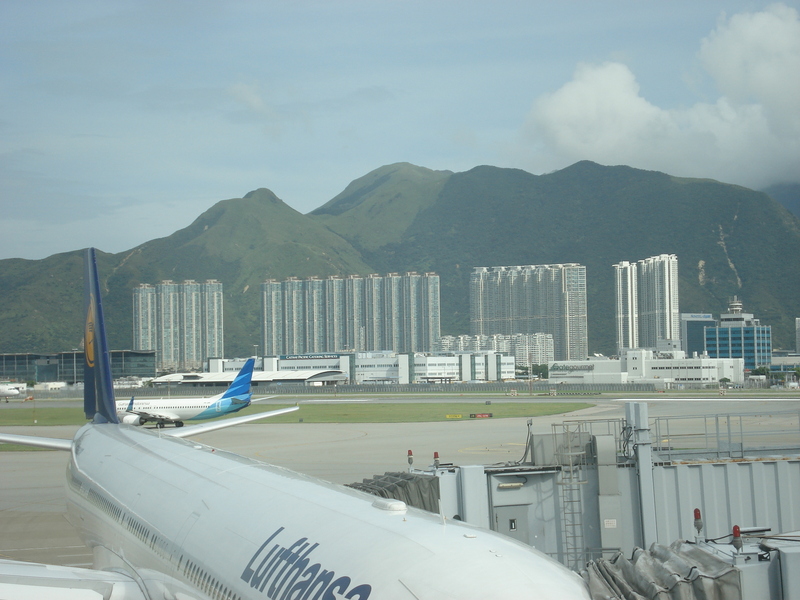 As the plane took off, I gazed out the window at the recognizable line of ridiculously tall towers that dominate the waterfront of Tung Chung where we lived, and my heart felt very heavy. It’s ironic, considering that when I arrived in Hong Kong I didn’t even particularly like it, to tell you the truth. But I suppose one of our greatest instincts is the instinct to adapt. Humans can adapt to anything, with enough time. What is strange becomes normal. New faces become trusted friends. An empty flat becomes a home. As the plane lifted off of the ground and Tung Chung receded below us, I let out the breath I didn’t even realise I was holding. No going back now. One adventure ends, and another begins. You get on a plane in one world, and arrive in another. It’s as easy as that. All it takes is one flight to change your life. I have been in Koh Samui about five days now, and already am starting to feel at home. I’ve been here a few times to visit my father, who retired here a few years ago, so it is pretty familiar to me. Samui is really such a lovely little island… white sandy beaches, blue ocean, amazing food, good nightlife, and beers are often little more than US $1. What’s not to like? There are two main groups of foreigners here — tourists, and resident tourists who just never go back to their home countries. I suppose I now fall into the latter category. That means finding a real house with a real kitchen for a few months, because you can’t very well live in a hotel. During the day, my father who has been living here for about three years has been very helpful in showing me around to different areas of the island, and checking out any sign that says ‘House for Rent’ so I can find a place of my own to move in to. A very very nice place... for just US $600 a month! 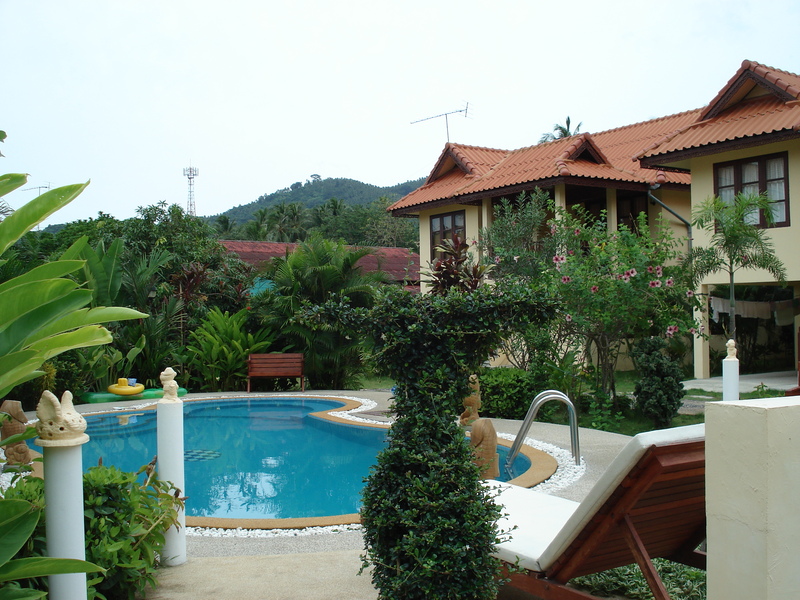 There are lots and lots of places for rent, though Koh Samui is definitely a bit expensive. For a country where US $1 = THB 33, renting a house for US $1000 is considered obscene. Our budget is much smaller than that. Of course, the further from the beach or the main towns you go, the cheaper the houses are. But transport is an important factor. Most people who move here buy a motorbike. But yesterday as we were driving down the road we witnessed a traffic accident. A foreign guy in a jeep hit an old Thai man on a motorbike. The old man’s body flew up over the handlebars of the motorbike, and seemed to float in slow motion through the air before smashing on the sidewalk, limp and lifeless like a rag doll. It was horrendous to see how easy it can happen, but it was also a good wake-up call for me. I will never drive a motorbike in Thailand. Both the locals and the tourists seem to be allergic to wearing helmets, which means that people crash and die on motorbikes all the time. I’m only going to be here for six months, so I’d rather not take any unnecessary risks, or get into any stupid accidents. 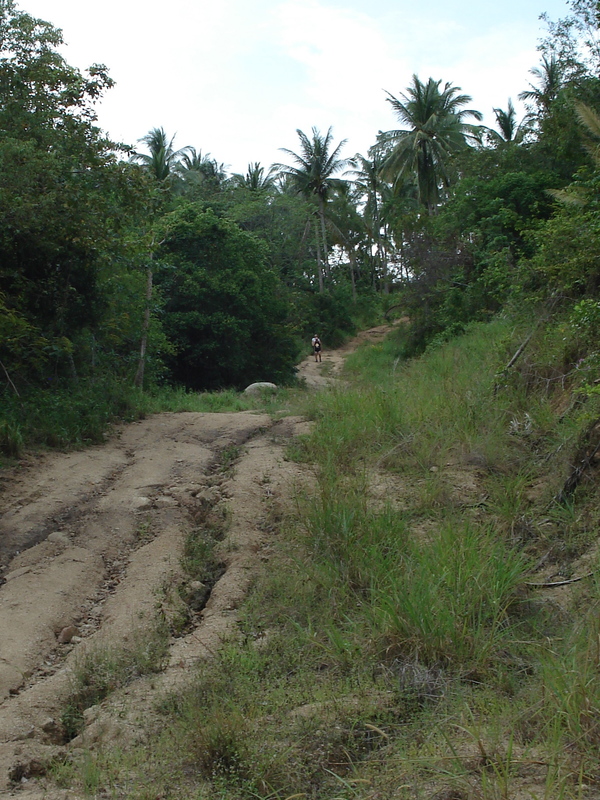 Anyway, other than house hunting, we’ve been out and about enjoying what Samui has to offer. 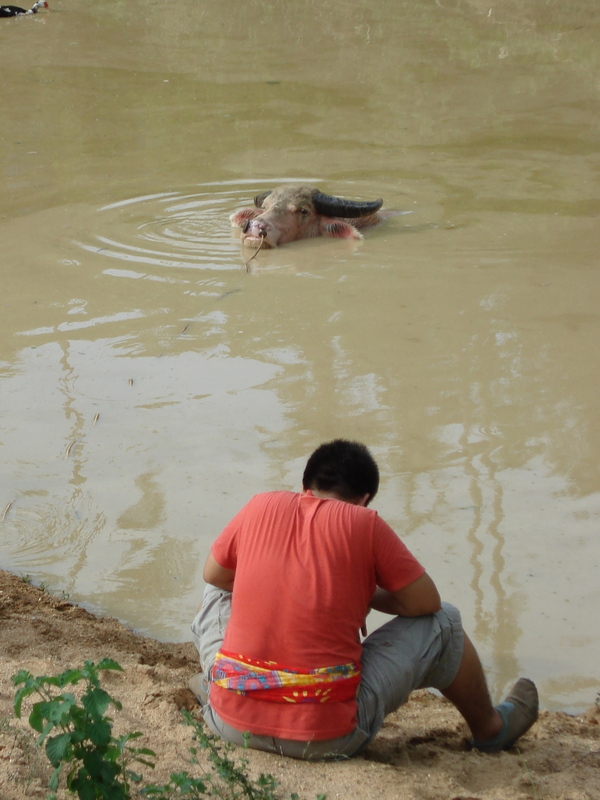 On Saturday we joined up with the Samui Hash House Harriers, and found ourselves running through a field of very testy looking water buffalo who definitely did not appreciate our presence. I’ve never been a big Hasher, having only been on a few in Trinidad, but it was great fun and I will definitely go again. It’s an older crowd, mostly made up of retirees and other beach bums, but they’re a very friendly bunch. It’s good exercise too, which is definitely necessary here where it is all too easy to eat too much green curry and drink too many cheap beers. 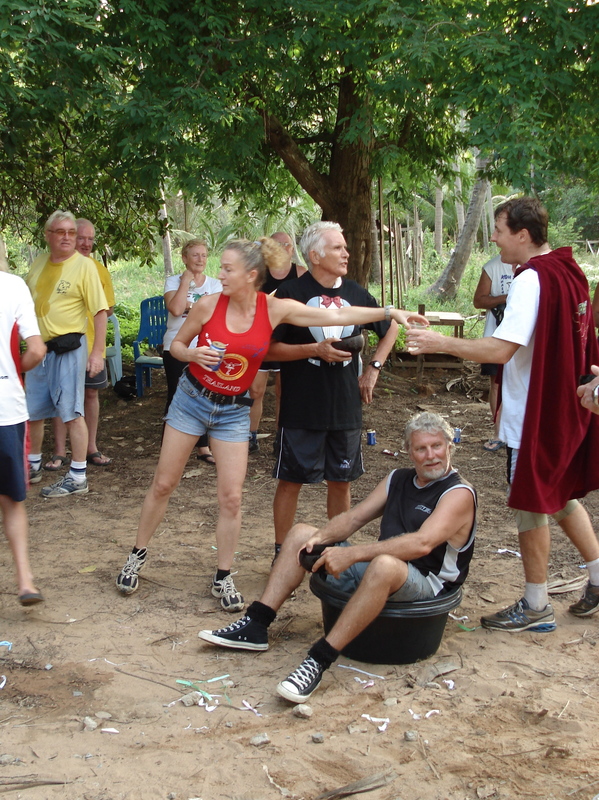 Scenes from the Hash: buffalo cooling down, way up in the bush, and the crazy antics afterwards! 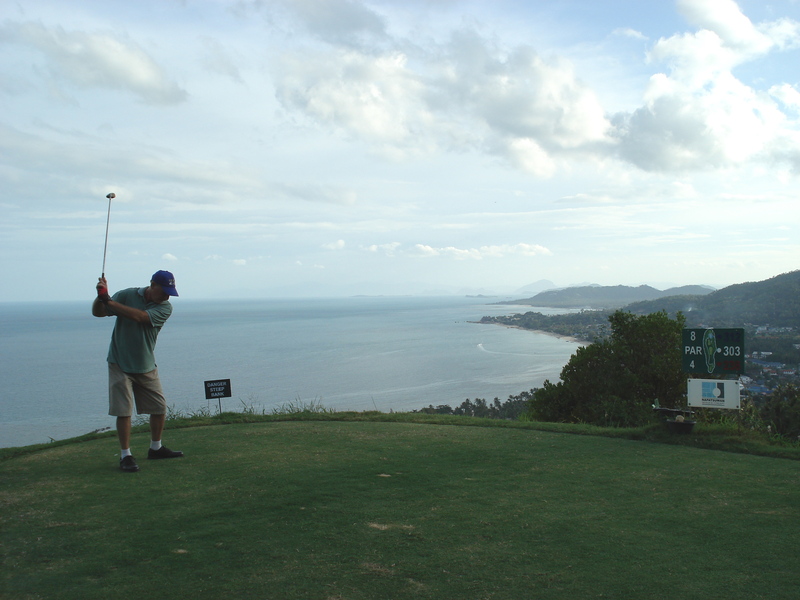 Yesterday we tried our swing at the Royal Samui Golf Club, way up in the mountains overlooking Lamai Beach where my father lives. What a funky little course. Whoever designed it either has a weird sense of humour, a sadistic streak, or a drug problem. For example, on the first hole a humungous limestone rocks sits smack dab in the middle of the fairway, and there’s no real way around it. We lost a lot of balls on the course, but had a great time nonetheless. It felt damn good to smack that driver on a real course, instead of just a driving range. I actually don’t have much more time here, as in a few days I’ll be leaving Samui again, and starting a month-long trip. First I fly to Tokyo to stay a week with my husband and the in-laws. Then we spend two weeks in Alaska, trying to catch some king salmon and dodge hungry bears. After that, I return to Tokyo for one more week, and finally in September I come back to Koh Samui. I’ve never done such a long trip before, and talk about three completely different and contrasting places — Thailand, Japan, and Alaska. But like I said, all it takes is one flight to change your life. The wonders of modern international travel. Anyways, that’s the update for now. It’s 4.30 pm, and it’s time for a cold Singha. If anybody needs me, I’ll be on the beach…. I know you’ll have a lot more to tell when we see you in Alaska. I’m hoping the weather will change and we will have some summer for you to enjoy the sites here. Wishing you the best in your new journeys.